This is an appointment only location. Responsible for management of Podiatric Surgical Residents and student interns. Coordinate all affairs of the residency; Liaison to the Executive Committee and Department heads. “Tumoral calcinosis fo the plantar forefoot; A case Study” published February 1, 1996; co-authored with S.F. Boc, D.P.M. J Heller, D.P.M. and C. Paladino, D.P.M. “Surgical Management of Deep Space Infection: A case Report” co-authored with Steven F. Boc, D.P.M. “Lateral Ankle Instability; Anomolous Peroneous Brevis Tendon” co-authored with Timothy Whyatt, D.P.M. and Corey Ruth, M.D. “Ankle Joint Fusion: An alternative Technique” co-authored with Timothy Whyatt, D.P.M. 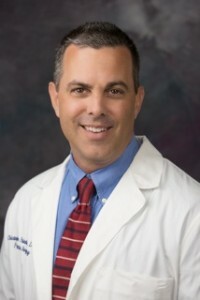 and Corey Ruth, M.D.